Went up in changeable conditions with around 2cm (!) already down, by midday it was hoofing and fluffy! Only about 10cm but more than welcome. Spent a fun couple of hours hoonnig in the Chantemerle trees and finished off with a cold 'un! Total of around 15cm from yesterday and stayed surprisingly light! Prorel trees today and was very nice thank you! Seemed like La Grave had a bit more than us, so headed over to check it out, very nice from top to bottom, almost boot-deep and like Serre Che yesterday, still light and fluffy! Blue sky, no wind and nicely skiable all the way down, not too shabby for January! On the third day of sunshine in a row in Serre Chevalier, the wind-blown rain-soaked sastrugi-ridden off-piste was starting to turn spring-like! In January! 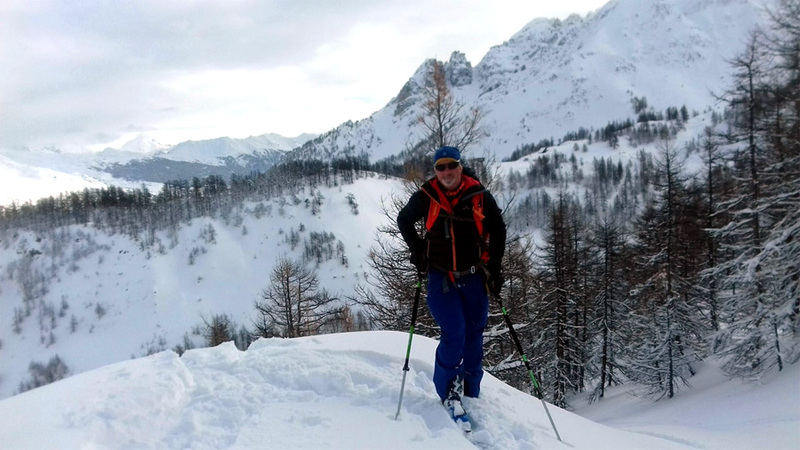 I opted to drop into the Partias valley today from the Col de la Ricelle on a mission to ski to my front door in Prelles, normally a 20 minute drive from Style Altitude HQ in Serre Chevalier. It was reasonable spring-ish snow down to the Lac du Partias, then skins on and Greg and I made the Col de la Trancoulette (2293m) in a comfy 40 minutes and took the plunge of skiing down the valley. We followed the Trancoulette river down to the summer village of Ratière, then the snow-covered road down to our front door! Mission accomplished, around 1100m descent to Prelles at 1200m through varied terrain and something I may not be able to repeat as most of the run down is south-facing and even in January, the snow was starting to get thin as we got lower down. 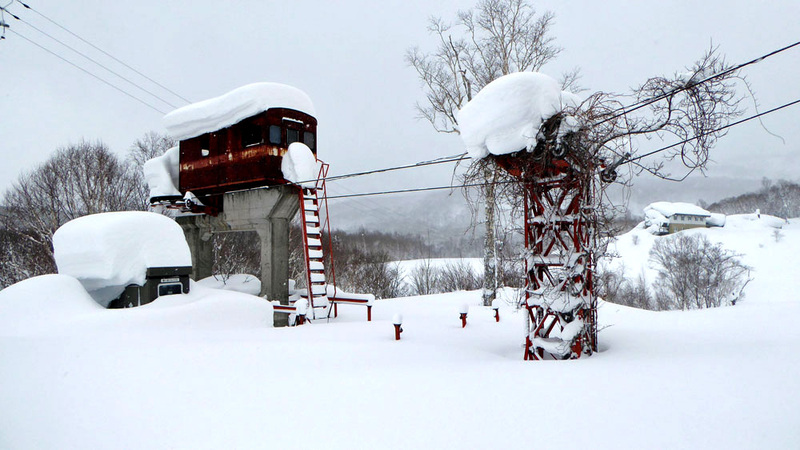 Yesterday we had our own private ski resort at Weiss Mountain about 20 minutes outside Niseko which last heard the sound of ski lifts 18 years ago. It might have been a bit of a problem had we not had a Cat snow plough to take us to the top and pick up to do seven laps of waist deep powder throughout the day. 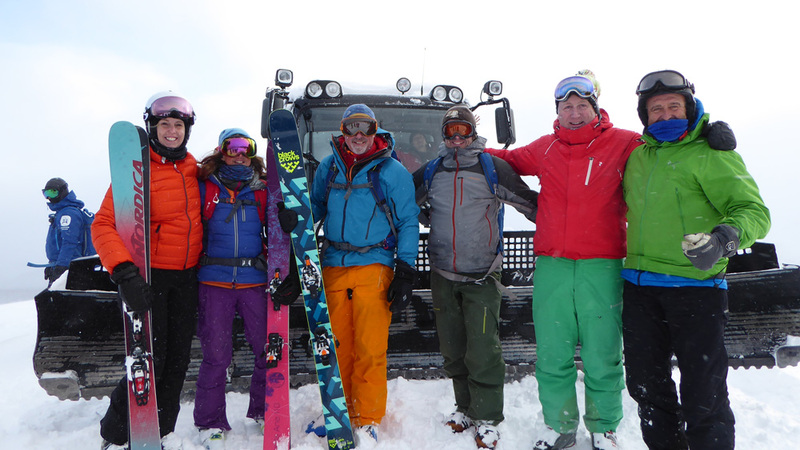 The cat skiing crew which included four guides take up to 12 people per day. We had 11 including three snowboarders and six of us. It had snowed oh prpbably a metre since the day before and was still bucketing down when we were collected at 08.00 so the visibility wasn't the best. At the top there was a quick briefing about terrain and the lead guide disappeared into the ether heading down the first pitch which was so mellow it made you realise that there IS such a thing as too much pow when you need to get some speed up. We did four laps in the morning with steeper lines, doing the old pistes and through trees. 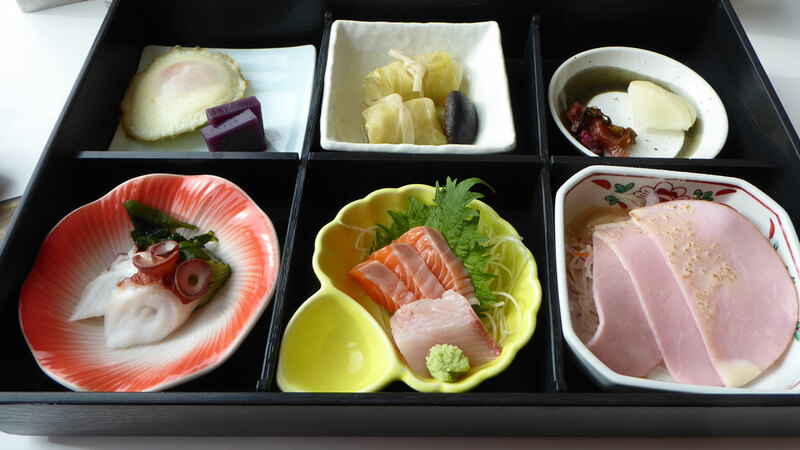 We stopped for lunch in a hotel, bizarrely in the middle of nowhere and had bento boxes of amazing Japanese food. Then we saddled up to do three more runs in the afternoon with the vis getting so bad with strong winds that the last two pitches started further down. Finally, we had a brief break in the cloud for the last run down at around 15.00. It was not so much backcountry as old country and a pretty amazing way to access powder without getting into a heli which, let's face it, would be impossible in the constant low vis and falling snow. Plus it's significantly cheaper. Cat skiing, also, has all the benefits of ski touring as in getting away from the hordes, without that uphill slog. A win win. So we headed up that bad boy, Mount Yotei, the volcano on Wednesday. The wind had howled with quite a bit of snow the day before but the morning dawned with an unfamiliar yellow orb in the sky that managed to hang around until midday. 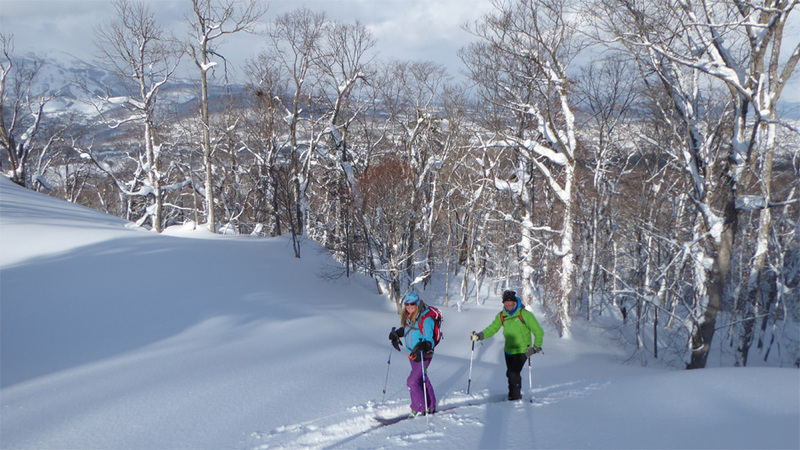 The sun, evidently, is so rare during the ski season in Niseko that the guides have to take Vitamin D tablets. We were the only van in the parking area and saw no one when our ski touring group - Gav, Samir, Luke and me - and our guide, Cveto Podlogar, who has lived in Japan for over 26 years and is one of few UIAGM guides in Japan and the only non-Japanese national to have been accredited to the Japanese Mountain Guide Association, hiked up nearly 1000m to the top of the tree line of Mount Yotei where the -15C temperature made transitioning a finger-freezing process. 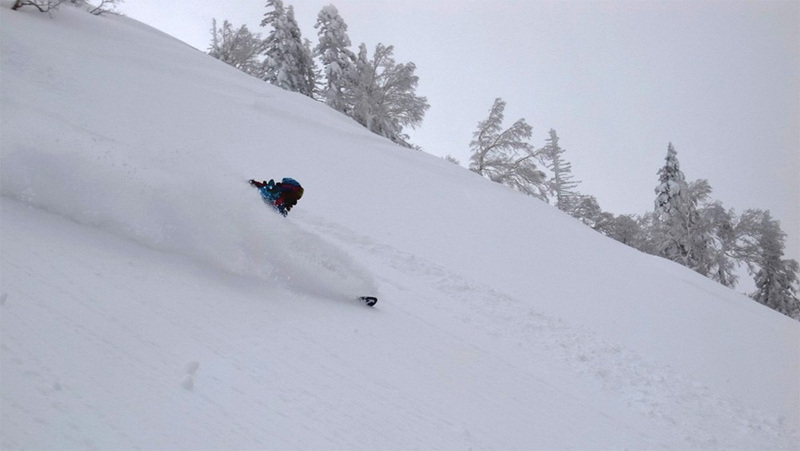 Coming down meant avoiding tree holes but enjoying thigh deep Japow. 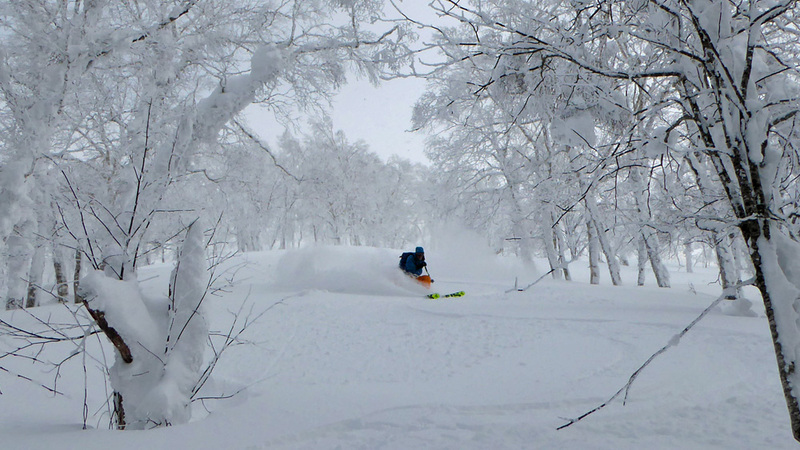 The other group had a guide to go through the gates and find powder in Niseko. But the Wonderland link was closed and the top 'Pizza' boxes lift didn't open because of the winds but they did the classic Watermelon and Banana. Apparently the upper access gates have only been open once in the last six days. Yesterday, Thursday, was a road trip to a smaller resort with all the group, eight of us, back together. There was nice cold powder but it was getting quite tracked out. Gav, as usual, turned into powder sniffer dog and ventured to the ridge at the top to look over. 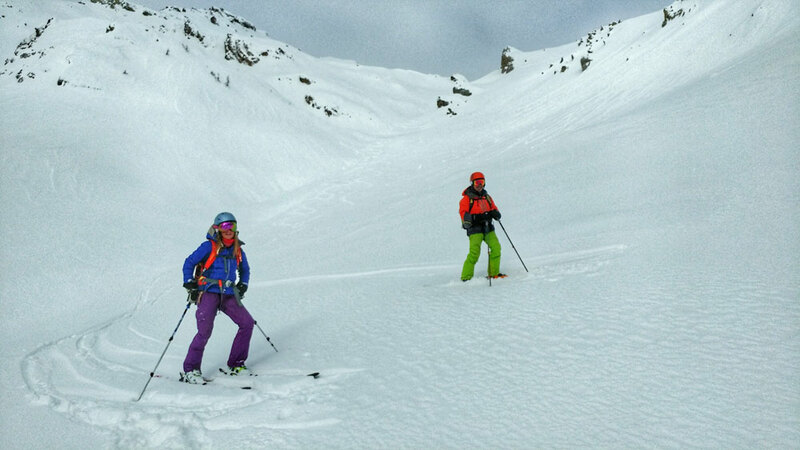 Soooo as the group were heading for a late lunch we went off the back as Gav and I were packing skins and, sadly, the others were told to leave them in the van by the guide who obviously couldn't be bothered with touring and only wanted to do sidecountry.. Lying in a hot onsen bath with light snow flakes dissolving in the steam and a view of fresh tracks between silver birch trees, well it doesn't get much better than that. 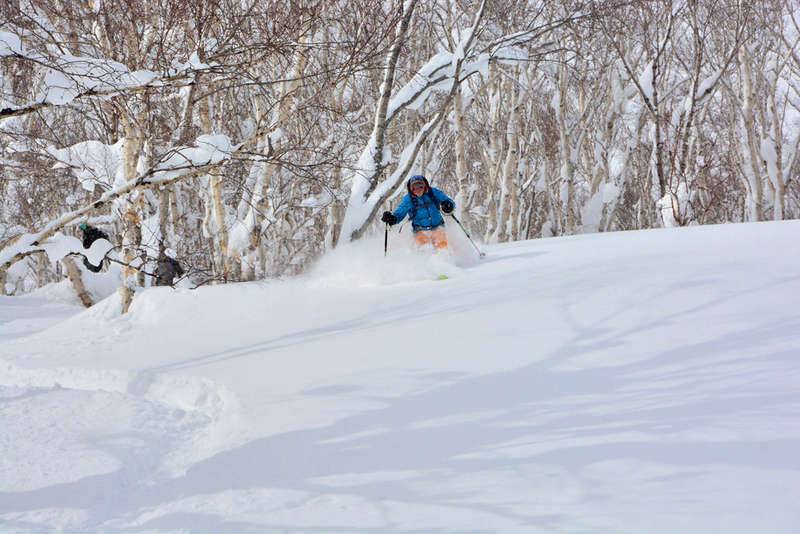 Especially as we'd been ski touring all morning receiving face shots of Japow. 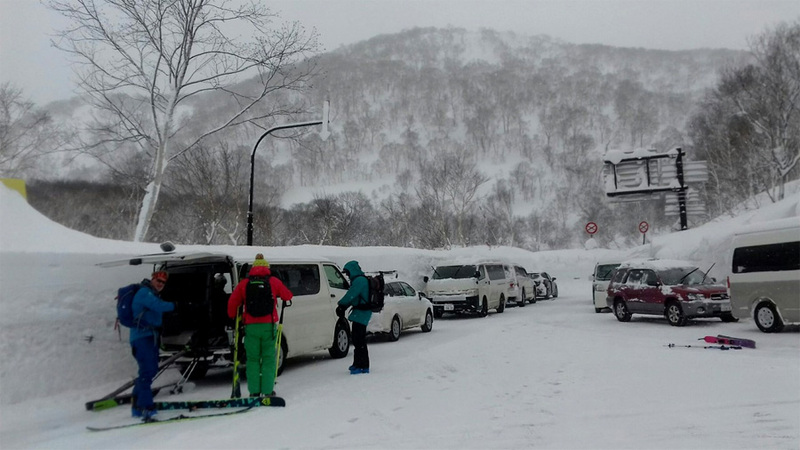 This is what we'd signed up for coming to Japan rather than skiing in Niseko resort where there may be masses of snow but also masses of people skiing it. 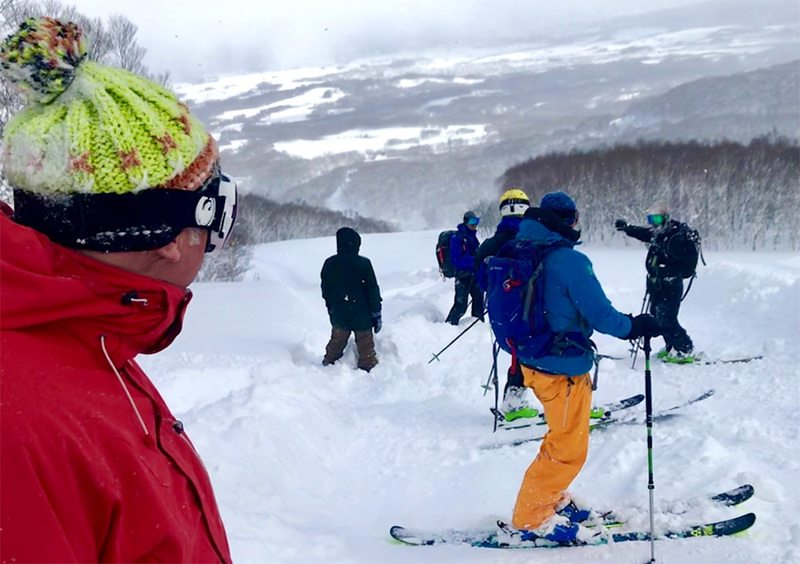 Our guide, Zack from Niseko Photography & Guiding picked four of us up in his van at 07.45 and we drove for around 20 minutes to Nito, parking up with half a dozen other vans beside a wall of snow over two metres high. It was around an hour's hike up with Zack making tracks and bashing the snow making kick turns sooo easy #perfectguide #gavtakenote. 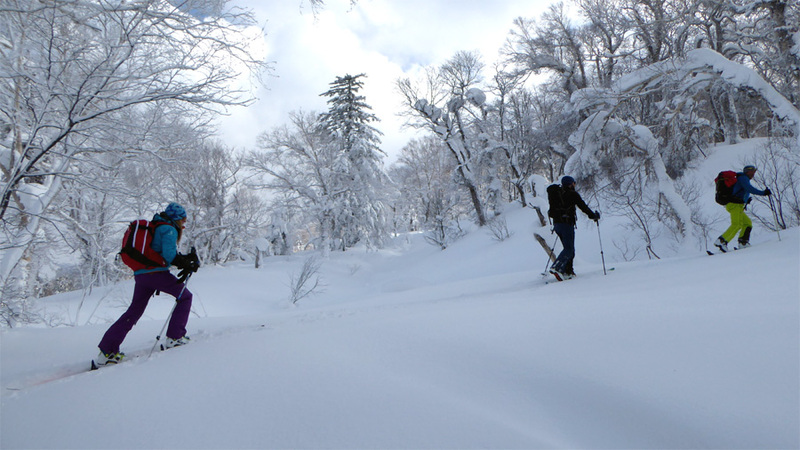 Then it was a ski down through the silver birch trees in classic Japow and another skin up to do it all again. The sun even came out for a while so we could actually see not only where we were going but also the views including Mount Yotei (main image above). Mike and I then decided it was time for a soak in a nearby onsen while Gav and Samir did another tour with Zack. The natural hot spring water was a pretty amazing finish to the day, even though the smell of sulphur seeps into your skin - and aroma wise it's no Chanel No 5. As the winds were due to be howling at 70kph today, Tuesday, we're taking a break plus most of us are hanging a tad after doing another tour but of the bars and night life last night. 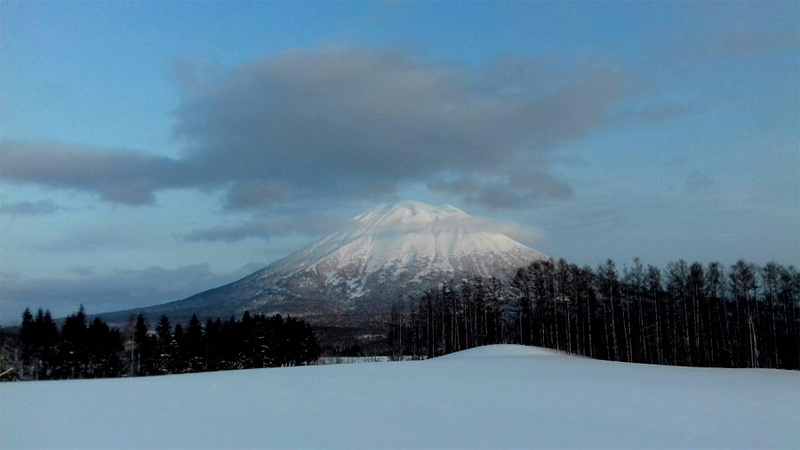 No one really tells you just how long it takes to get to Niseko, especially when your first flight is delayed at Heathrow and you miss your connection at Tokyo for Sapporo. 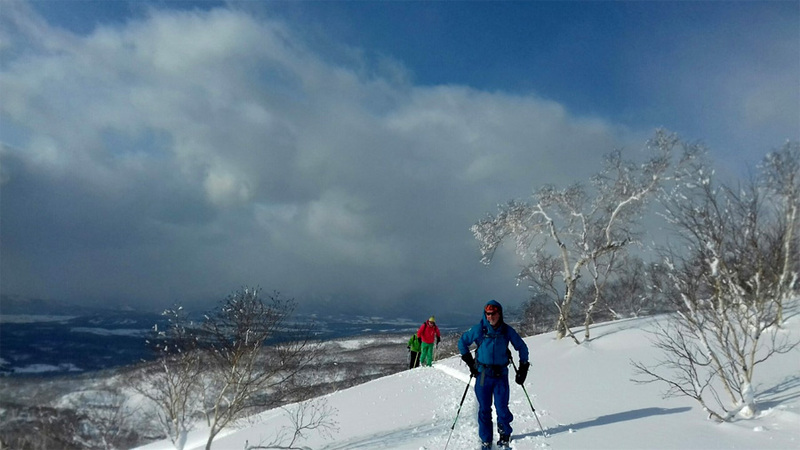 We left at 06.00 on Friday morning from Worthing in the UK and arrived at our house in Niseko at 18.00 on Saturday evening, taking into account nine hours time difference. For some reason, after a few beers and dinner, we all woke up at 02.00 Saturday morning, 17.00 Friday UK time. Some of us went back to sleep, others only dozed until rising around 06.30. It was snowing when we arrived in Sapporo airport and is still snowing now on Monday evening. It was also very cold with a wind chill of around -27C during the afternoon. What to wear? What not to wear? I put on nearly everything in my ski wardrobe to keep warm in the Arctic conditions. Yep, I wore everything that's in the image below. We skied some of the classic off piste through the gates including Strawberry and Blueberry Fields. Then a Miso Pork and Rice soup for lunch and up again but then the weather really closed in so we were back in our majorly cool Japanese house (three floors, four bedrooms, three bathrooms) for 15.30. Meanwhile back in Serre Che, 30cms of fresh fell overnight. For Ken it was first lifts up and several laps of the Chantemerle trees. Sadly by 11:30 all the upper lifts were closing due to high winds, legs were getting a bit tired by then anyway, so skied down off-piste by the side of the Luc Alphand black run back to town. 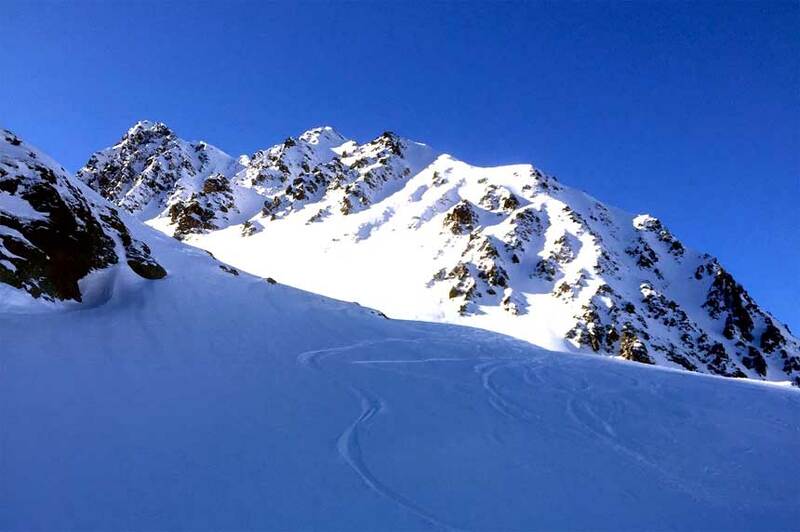 So, with 10cm fresh snow overnight headed up yesterday (Tuesday) to the Col du Prorel and skied around the bowl to the south and rode down to the bottom of the old Rocher Blanc chair, joining up with the blue chemin back to the mid-station. Repeated a couple of times as there was around 20cm of fluff in the gullies on the way down! Today (Wednesday) most of the lifts above 2000m are closed due to high (50kmh) winds and zero visibility so decided to pass! 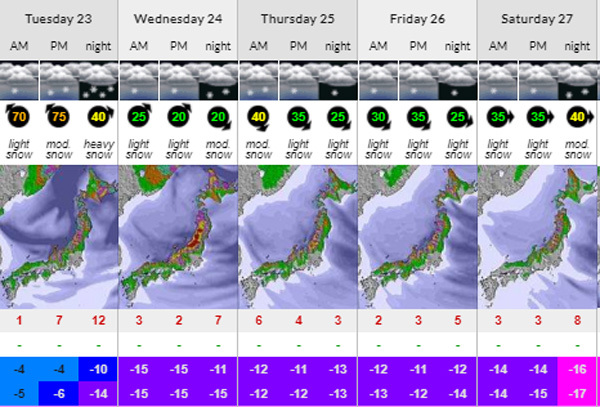 More snow due over the next several days, so here’s hoping for more powder!. 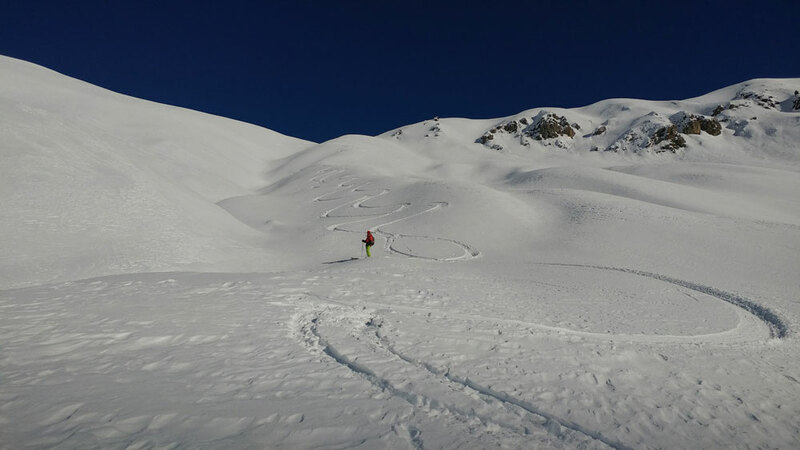 It was a big slackcountry tour off the back of the Col de Mea and down to the Vallon de Chambran, traversing up the valley and then a tough climb back up to where we were yesterday (see Ski Blog, 13th January).. The learning curve of filming with the drone is very high but slowly getting there and understanding better, helped by now using an iPad Mini. 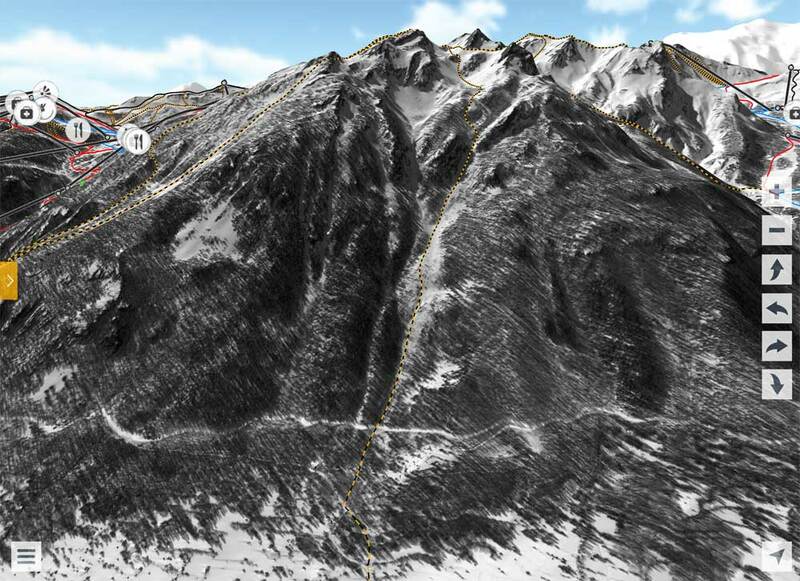 Though I still need to work on getting the drone to follow people while they are skiing! Filming in powder in the backcountry requires various techniques and getting to grips with what is the best process for setting it up, take off and landing like skis upside down and using those with a tupperware lid on top. 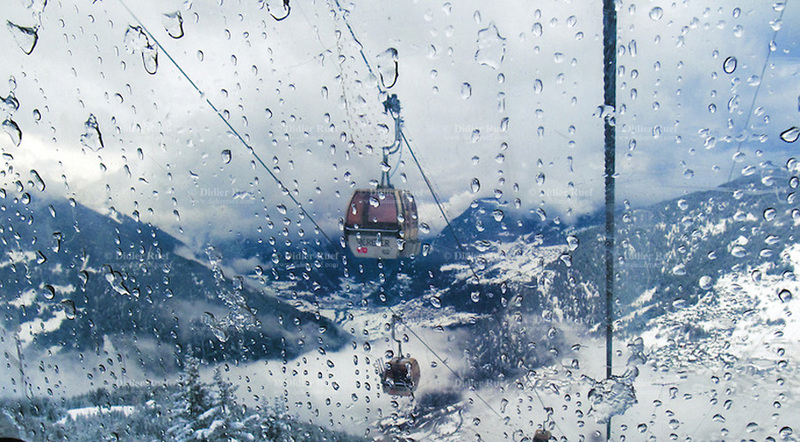 The rain has finally turned to snow in Morzine. I'm starting to feel a bit less left out now, having spent the last week listening to the stories about epic snow, avalanche Risk 5 and travel chaos around the rest of the Alps - well, maybe not the avalanche and chaos bit. But I like it when it rains in Morzine - not least because, when it rains, the bookshop sells more of my books! Even though rain turns into money for me, I do feel sorry for my guests who’ve been looking forward to their annual skiing trip only for it to turn into a snorkelling one. When it rains in a ski resort other nationalities go shopping and the more sensible British settle into a coffee shop with a good book – but it’s only the English who insist on going skiing in the rain! It could be our stoic nature or our hatred of waste that forces us up a mountain when water is running down it. We don’t want to waste the lift passes we have already procured or lose a precious day’s skiing. It might be that, with only other English people on the slopes for comparison, we feel like better skiers on a rainy day. However, despite our penchant for aquatic skiing and the fact that we come from a green and pleasant land, where it rains quite a lot too, we seem to wear the least waterproof clothing of any nation. I know it grinds having to buy specialist clothing for a holiday but an anorak for George and some walking trousers from Cotswolds Outdoor are never going to cut it. My guests often set out hoping the precipitation might be snow higher up, but I know they’ll be down early looking like drowned rats and walking in that my-pants-are-wet way. I also like the rain because it forces most guests to relax. Having been brought up by Ski Nazis (see No 11 of the 19 Worst Ski Chalet Guests), I used to feel guilty if I didn’t 'carpe diem' and catch the first lift up in the morning whatever the weather. There is always someone staying with me who drives the Nazis' agenda and makes me set an early alarm. 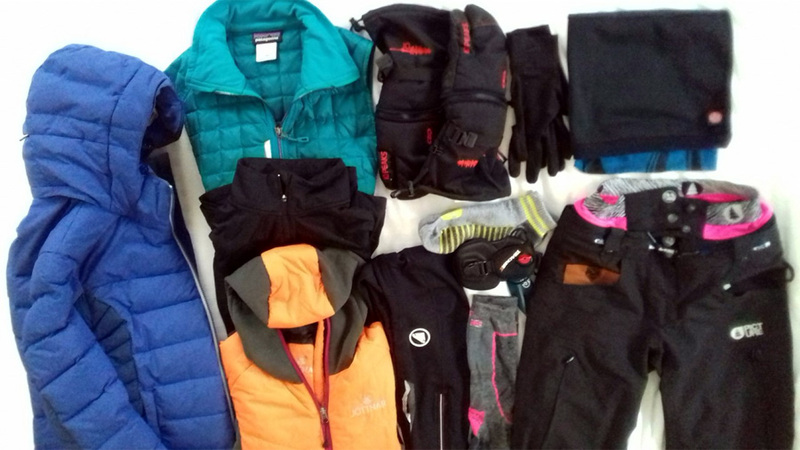 They rush through breakfast, break into a sweat donning layers then frantically assemble the vast array of kit needed to go skiing. I sometimes wish I had adopted a simpler sport - like water polo, for instance, you just grab your speedos and go. But rain dampens the resolve of all but the most hardened ski fascist and gives reprieve from the normally hectic agenda of a chalet host. I also like chilling in the chalet when the weather is lashing against the windows. The empathetic rain puts me in a reflective mood and I often have a productive day of writing. I put myself in a Jimmy Hendrix frame of mind: ‘Rainy day, dream away – Ah, let the sun take a holiday’. In my case, no marijuana is needed to achieve this karma. Rain means skiing is off the cards for me and I can take a relaxed approach to the day. 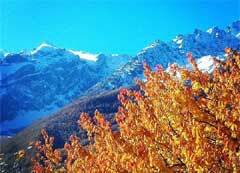 I can leave the chalet unburdened by equipment or geographical objectives and run a few overdue errands. Once the aquanauts are dispatched and the errands are done, I like to sit outside my favourite coffee shop in town, watching the other mad dogs paddling off to the lift. I sit outside under a brolly, sipping coffee, listening to the rain pattering on the canopy above and the bellowing of the swollen river that runs below. It’s time to enjoy living in the Alps rather than sliding down then. Once I’ve got the soggy rodents home, the chalet turn in to a laundry with every available drying surface strung with damp garments. 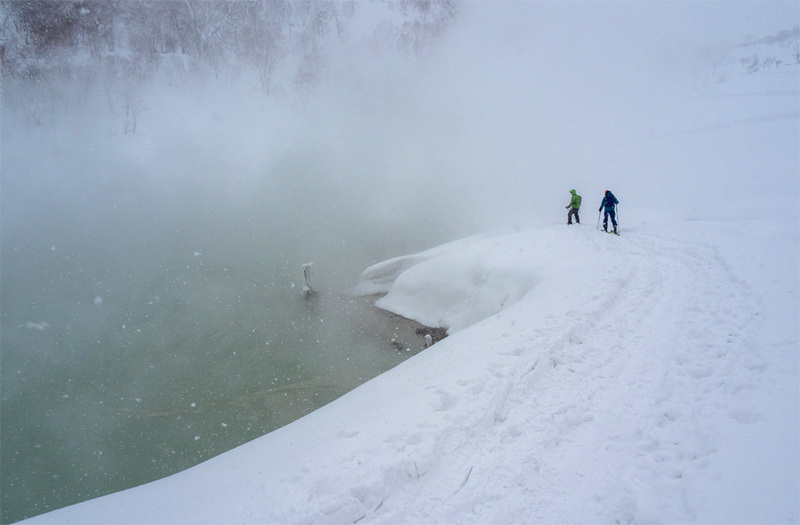 If there is a reward for going skiing in the rain, it’s that it amplifies the feeling of being dry, warm and safe once you are finally back by the fire, sitting in dry underwear. I’ve noticed that many of skiing’s rewards come post activity - such as the unadulterated pleasure you get when you finally take your boots off. I often think that the sole purpose of skiing it to experience that moment. Despite still being English, I no longer go skiing in the rain. One of the benefits of being a Seasonaire is that you can choose when you go skiing and it’s quality not quantity I’m now after. I save my knees for better conditions and as Jimmy suggested, I just ‘layback and groove on a rainy day’. 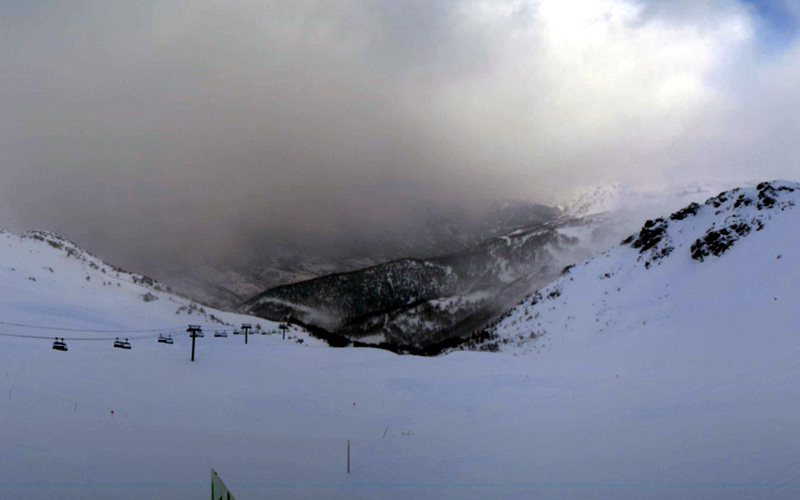 No fresh snow today but more of the resort is open giving access to yesterday's 30cms plus. 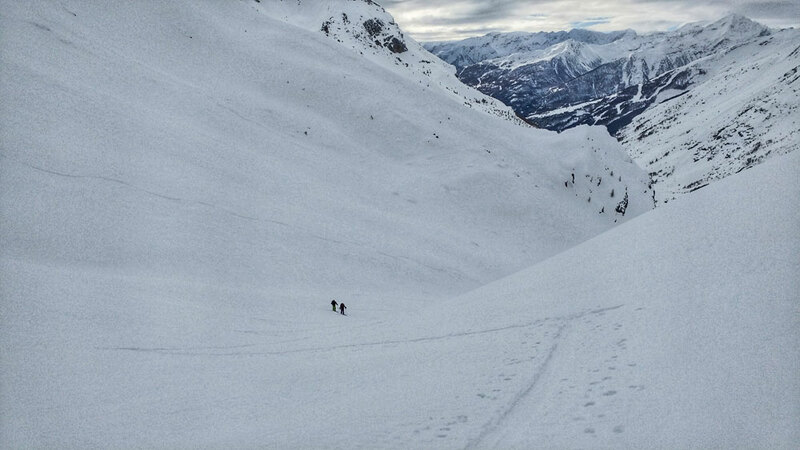 We had a later start, arriving at Monetier around 10am but it was fairly deserted and, considering the time, there was plenty of untracked. 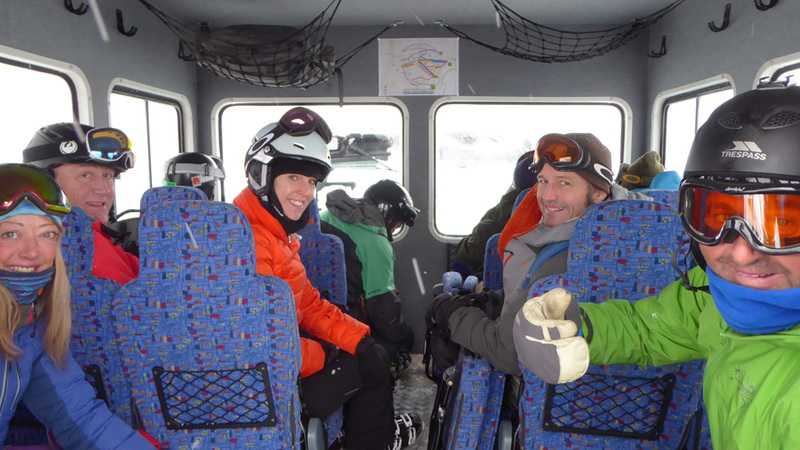 With the Cibouit lift open (not Yret) there were a few freeride groups heading right off the chair. We did one run, cutting through heavy snow at the bottom in the trees back to the chair - and then decided to make the big descent, traversing at the top and dropping down over amazing snow into the tree line whiere Gav was caught in an avalanche last year and lost a ski (never been found!). It started to rain and then snow last night so we didn't quite know what we were going to wake up to, this morning. But the plan was to do first lifts anyway come rain or snow. As it happened it was snow at 08.00 although still rather warm, 1C outside our apartment, so we headed for Monetier where there are fewer people and plenty of trees to play in with the top lifts closed and avalanche warnings throughout the Alps. 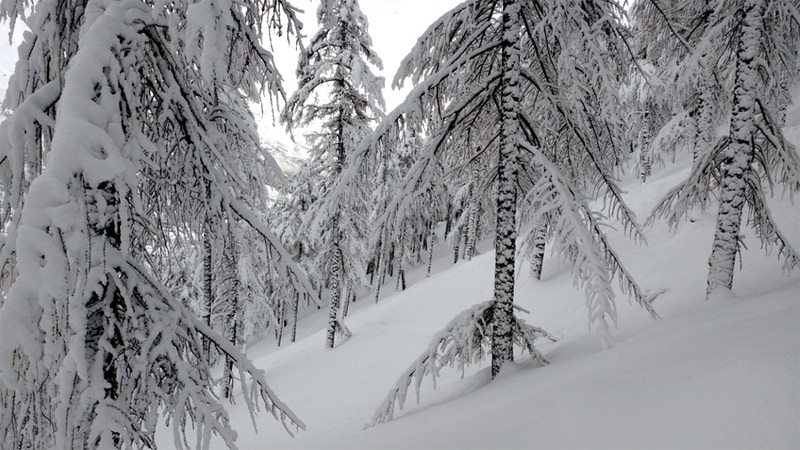 The vis wasn't great going up the Bachus chair and we were fairly covered in snow by the time we arrived at the top but, whoop, the piste on the right was knee deep in fresh which we shared with a small group of freeriders and then had the trees to ourselves. Next lap was the secret piste the other side of the drag which was closed and completely untracked (but we had avy bags and triggers ready) and worth three laps before a hot chocolate. What next? Gav wanted to do the Crete des Lauzieres, hiking across at the top of the Bachus but I was slightly intimidated by that exposed ridge in low vis. As it happened there was plenty of visibility which wasn't such a good thing as I'm not sure I want to see that rather gut-wrenching drop either side! But after a side slip and a kick turn it was only around a 7m ski on the narrowest bit until reaching the safety of the trees..
We awoke to a fair amount of fresh cms though we knew it had been windy so we were not too sure as to actual conditions, and as it transpired first few runs were very pleasant indeed. 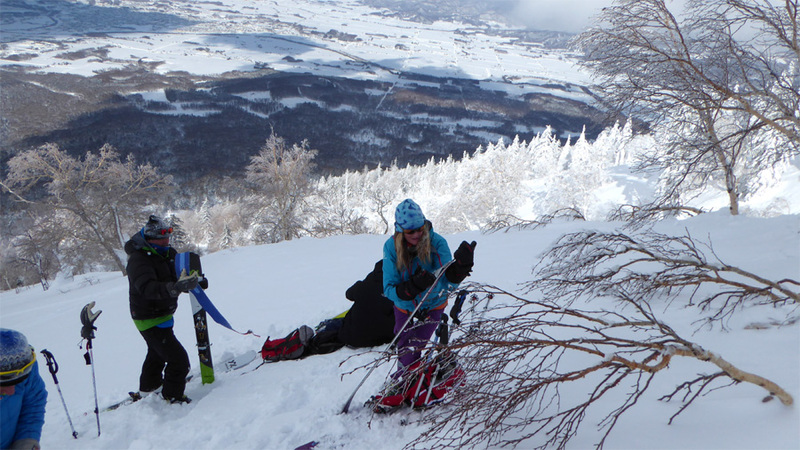 We then took Vallons lift and hiked along the Roche Gauthier ridge and dropped in and that too was great though lower down snow was sketchy out of the trees, not too sure why, though possibly the wind and not helped by poor visibility. With Elaine opting to retreat back home due to the poor light I suggested a route that I knew could well provide some drama as well as some epic lines. The hike up Cucumelle was pretty tough and it was obvious that the snow was going to be very wind affected on the other side, though that was bit of an understatement as once at the top we had to walk down around 100m over the exposed rock and shale, and then once skis were donned it was hard going skiing the sastrugi in very poor light. 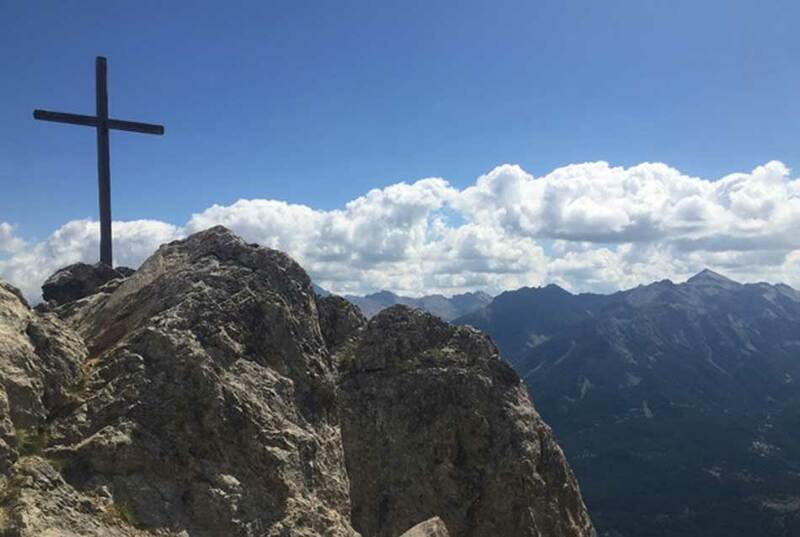 I decided to only opt for the Tête de Grand Pré traverse if someone had already made the track and as we were hiking Cucumelle I could see three skiers making their way. It was extremely difficult with the poor light and lack of snow to get the right line to the traverse but we eventually made it to the notch in the rock you have to climb up through. However one of our party managed to loose a ski climbing through which resulted in a 10min climb down and 25min climb back up to get said ski. It was once pass the notch that I saw that the previous group had skied down from there and not continued with the traverse. Whilst the ski was being recovered a guide with a small group came through and cut the track with me going second ensuring good spacing and making it slightly easier for the guides group. He then carried on a slightly lower line which had me thinking he did not know the route too well. The route I wanted to do was a variation on the Guibertes Couloir I did a couple of years ago. I was pretty sure after studying Google Earth and maps that there was different entry to the route I had previously done and FatMap confirmed that. Not least it was written by someone I knew and trusted. Ironically just as we were about to set off from the Col three PGHM guys (Pelotons de Gendarmerie de Haute Montagne) came by and we chatted about the route not least as one of them only knew the route I had previously taken and was unaware of this (easier?) entry, so no real pressure then if I'd got it wrong as they too followed us! What I feared most was actually worse than I thought we might encounter, a total lack of snow due to the strong winds and once we put our skis on the snow was not at all pleasant to ski though the PGHM dudes skied it without any problems. The route finding is very complex though were helped by the tracks of the PGHM but at the same time I did think that they might well take a more extreme line to a more conserabtive one that would be more suitable for us. 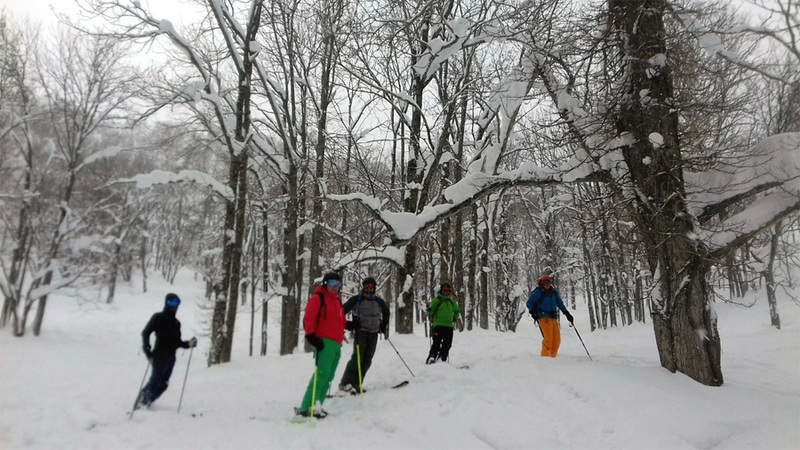 As soon as we were in the trees the snow just got better and better the further down we skied. Strange as it's usually the other way round! Lower down and between the trees more bushes meant combat skiing as its best and there were some very tired bodies once we made it down to the X-Country track where we then had 3km of poling to get back to the van!